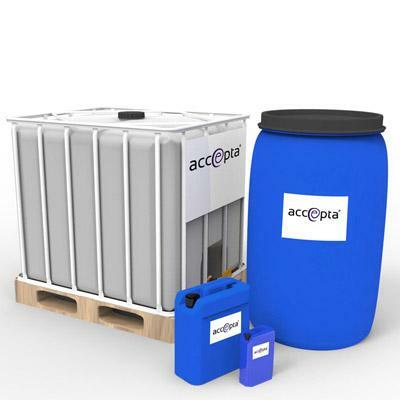 Accepta 2308 is a high performance water treatment product scientifically formulated using a blend of organic and inorganic corrosion inhibitors that offer the ideal treatment for closed chilled water and low pressure heating systems. If you require product selection assistance or technical advice please contact us. Although unsuitable for use in systems containing aluminium, Accepta 2308 is particularly effective in protecting steel, copper and other non-ferrous metals. With the added benefit of lower dosing rates than the more traditional nitrite-borate based corrosion inhibitors, Accepta 2308 raises the system TDS to a much lesser degree. Accepta 2308 should be dosed at 1000 – 2000 ml/m3 in order to give an active reserve of 200ppm of sodium nitrite. The precise dosage rate and frequency will be advised for each specific application. In systems requiring significant passivation higher initial dosages may be required to yield the required nitrite residual. Our product specialists can provide advice concerning the optimum dosage rates and testing regime for individual systems. For further technical assistance concerning Accepta 2308 please contact Accepta.